I first met George Duncan in the mid-1980’s when I became team manager for the Clydesdale Harriers team in the Scottish Athletics League – it was a new venture for the club which went on to be a very successful squad over the following twelve or thirteen years. George was a great help to me in all sorts of ways and I soon learned to respect in the highest degree the volume and quality of his work. At a time when there were five divisions in the league, four of eight teams and one which sometimes had eight but often only six, and when all matches were held on a Sunday at two – or even three – different venues, George would have the printed results – individual positions and performances for every athlete in every division as well as team scores and league positions by Thursday morning’s post. This was not a wee six-month flurry of enthusiasm, it went on match after match, year after year with seldom a break. On its own that was a wonderful performance but there was much more to him than that. Following on for a bit from Doug’s comment, George’s work-load was prodigious. In reply to a query, he once admitted to 40 hours a week was regularly done, unpaid, by his family on athletics business. On another occasion he replied that he had once calculated his expenditure on the sport and reckoned that it came to approximately £2000. But then like many officials, he was involved in the sport because he loved the sport. An old club official in my own club once said that ‘you do what your club needs you to do.’ This was a precept that George, and many another official lived by. His work went beyond the club and he did what his sport needed him to do. But essentially he was a member of Perth Strathtay Harriers where he was committee man, coach, trackside helper – and whatever was needed. Club mate Jim Hunter has this to say: “I joined Perth Strathtay Harriers in the late 1970s… George and Margaret Duncan were firmly established as willing parent volunteers in the club. Their three daughters, Margaret (jnr), Ialene and Morna were all members at one time or another. Margaret helped with coaching, George was already the Club Secretary – a role he held for the next 20+ years. George was tenacious in his approach to getting things done – if he couldn’t do it himself he knew someone who could help. He always put the athletes at the centre of what was important. His volunteering interests were wide ranging. 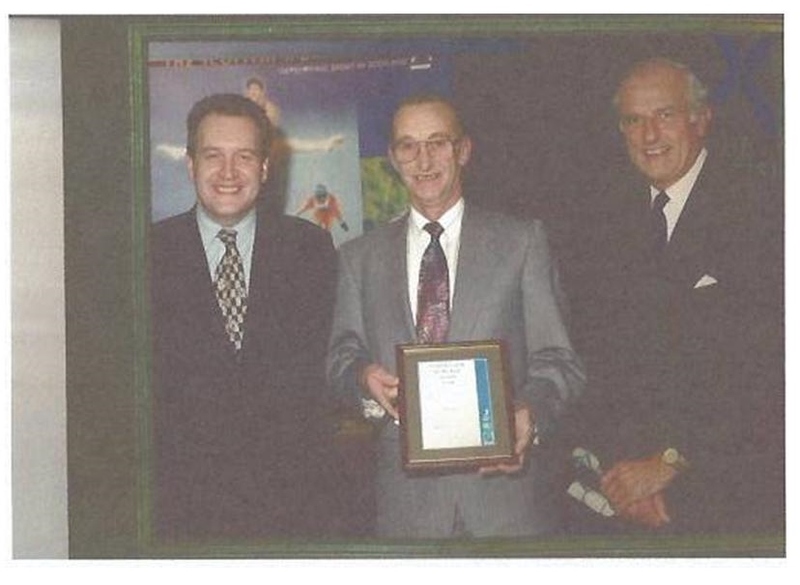 He was involved in many youth organisations in Perth and Kinross: The Boys Brigade, Perth and District Badminton, Perth and Kinross Sports Council. As I embarked on gaining my athletics coaching qualifications alongside his wife Margaret Duncan – George went down an ‘officials’ route…. and ended up a senior Marksman with Scottish Athletics. Margaret developed a successful sprints group and ‘team Duncan’ supported coach and athletes all the way. Names like Graeme Lammie, Jimmy Nicoll, Richard McDonald all were helped by George to reach their full athletics potential. George seemed to be able to meet any challenge with ease: officiating, organising leagues, teams, meetings with local and national organisations… But he was always there for the athletes, sharing a joke at training or at competitions “. Probably because of his deep involvement with his own club, George understood the feelings of members of other clubs – loyalty to Perth Strathtay did not blind him to the similar feelings held by others of their clubs. One example of this. Clydesdale Harriers started to take league athletics seriously in the mid 1980’s. The club worked its way up to the first division of four (as it was at that time) and in that season finished sixth, seventh and sixth in the first three matches and were sixth, well clear of the seventh team, going in to the final match. In that match, the club which was seventh ‘beefed up’ its squad by bringing in half a dozen athletes from a London club and so gained enough points to move up to sixth overall and we were relegated. I’ve never seen so many senior men, including several Scottish internationalists so deflated. George was not at that Meadowbank match but on the following Wednesday at an open meeting at Crown Point he put out a call for me to report to the admin room. When I got there he said he was sorry for what had happened to our club, he thought what had happened was wrong and would bring it up at the AGM. It was a thoughtful gesture. George was perhaps best known to the athletics world as an administrator and official. 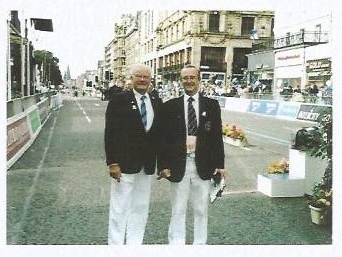 He was a grade one track referee who officiated at the highest levels within Scotland including the 1986 Commonwealth Games, where the rules are rigidly applied. He cheerfully and diplomatically defused many heated moments, but his regard for the young was evident at one schools meeting where an Irish lad, on his international debut, stepped out of lane. He should, indeed, have been disqualified, but George dismissed the protest rather than traumatise the youngster and perhaps lose him to the sport. When the Scottish Athletics Federation replaced the former governing body, the SAAA, their first handbook had George noted in many categories: as an administrator he was convenor of the Track & Field Commission and secretary of Perth Strathtay Harriers, and as an official he was qualified as a Track Referee, a Wind Gauge Operator and Photo-Finish Film Reader. Not noted in the book, he served variously with the national governing body as chair of the track and field commission, on the international selection committee, part of that also as chairman. He was secretary of the Scottish men’s league for more than 20 years, chairman of the Young Athletes’ League for 13 years, treasurer of the Scottish Women’s League for 10 years, founder and secretary of the national indoor league, and a great friend of school athletics – most of that simultaneously. He was grants co-ordinator for lottery awards, and a proponent of the grassroots Sportshall athletics programme for the very young. Alex Naylor once described a member of an SAAA sub-committee as ‘an apology for somebody who couldn’t be there’. We all know the kind of committee man he meant but George was far from that. He always stood up for what he thought was the right thing to do, no matter who he was up against. Some examples. First I quote from an article in the ‘Glasgow Herald’ of 6th November 1993. ” NOT for the first time, UK athletics rules have been changed for the benefit of English competitors to the detriment of Scots — but this time the English may have over-played their hand. George Duncan, convener of the Scottish Athletic Federation track and field commission, has appealed to the British federation, asking that a vote by the UK Women’s League last weekend be declared unconstitutional. The league voted 15-13 to exclude secondary first-claim members — namely, those who are members of one club for the purpose of local competition, but who also join larger clubs to compete at UK level. The rule prevents large clubs monopolising top athletes and allows the smaller clubs which nurtured them to benefit locally. It is of particular benefit to Scotland, who have just three clubs in the UK league. An unsavoury whiff of sour grapes hangs over the vote which changed the rules, for it was aimed at City of Glasgow, who have just won the UK league for the first time. The English believe many secondary athletes were used. In fact, Glasgow used only one. “Athletics facilities in Glasgow cost almost twice as much to hire as the national stadium in Edinburgh or comparable facilities at Grangemouth and Greenock. ”The Scottish men’s athletics league has not hired any Glasgow track this year, because the prices we were charged for their other facility last season, at Crownpoint, were too expensive,” said league secretary George Duncan. ”The women’s league, of which I am treasurer, was presented with a bill for more than #500 for our first meeting this year. ”We finally settled for #461, but will not be going back. We can get cheaper facilities elsewhere. If the same price structure applies at Scotstoun, we will not be using it all – the leagues would go out of business.” Duncan, also chairman of the McDonald’s league for Young Athletes, confirms however, that they will use Scotstoun track this weekend. Note that that’s George in three different league posts simultaneously – Men’s League, Women’s League and Young Athletes League. Many, indeed most, would shy away from any one of the three, it takes someone a bit different to take on three responsible posts and do them so well that at the AGM the comment is to recommend no change! And it was not just league issues that saw George Duncan spring into action. In the following report he is taking on the British Athletic Federation on behalf of Scottish officials. The BAF was threatening to remove many Scottish officials from their list of approved officials because they had not officiated in any match south of the border for two years. In Perth, on club coaching nights, he would be found with his clipboard, rain, hail, or shine. This continued even during the last months of his terminal illness. Two generations of successful athletes have reason to be grateful to him, up to his most major success, Richard McDonald, whom he steered to the silver medal in the 400m hurdles at the European under-20 championships in 1999. He was commended as Scottish Coach of the Year. Richard was best known as a 400m hurdler with a best time of 50.7, but he also had a 110 hurdles time of 15.53, 47.67 for 400m flat and 1:51.48 for 800m. Competitively, Richard ran in the Commonwealth Games of 2002, and domestically won the Scottish 400m Hurdles in 2002, was second in 2001 and third in 1997. If we need more evidence of his coaching, then we need look no further than James Nicol from the mid 80’s. James had a 400m pb of 47.11 and made the semi finals of the Edinburgh Commonwealth Games event at that distance. James also had a 10.7 100m and a 22.02 200m. 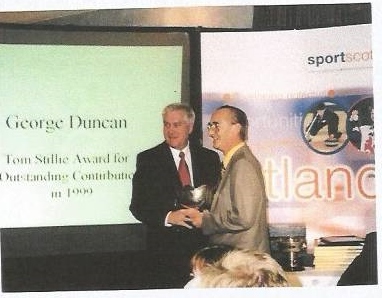 It says something about George Duncan that he was twice (1991 and 1999) awarded the Tom Stillie Memorial Trophy, a massive claymore presented annually to the Scot deemed to have contributed most to Scottish athletics. Only one other person has twice been the recipient – Olympic 100 metres champion Allan Wells. Locally too, his contribution was not taken for granted: he was presented with the George Mortimer Memorial Trophy for lifetime service to sport by the Perth & Kinross Council. He was himself a past chairman of Perth and Kinross Sports Council, and a driving force behind the establishment of the local sports medical centre. 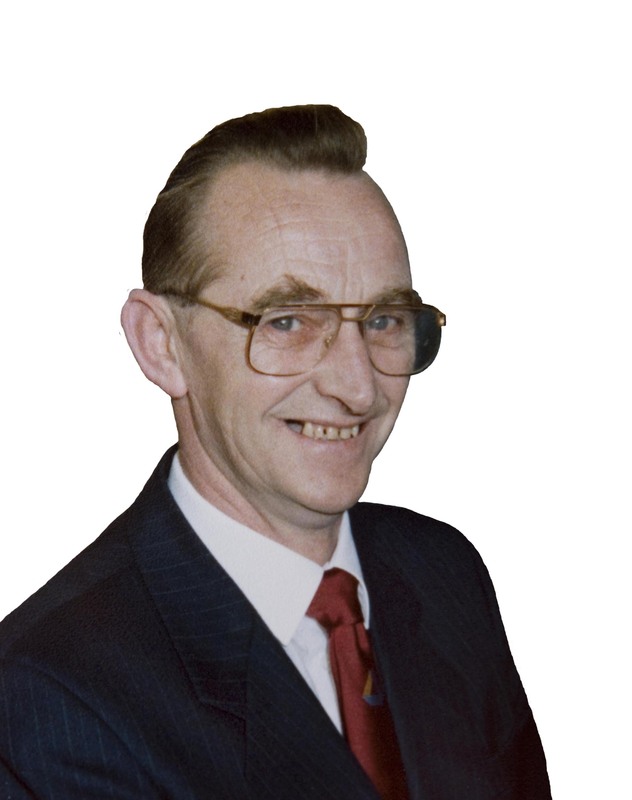 He was a leading figure in the Boys’ Brigade, and was active as a youth club leader in Blairgowrie where he grew up, one of a family of three girls and two boys. In 2008 when the new all-weather athletics facility was opened in the grounds of Perth Grammar School at a cost of one million pounds, it was called the George Duncan Athletics Arena and a fine tribute to the man it is. Eight lane track with facilities for all field events and as much equipment as such a centre needs. Of course Perth Strathtay Harriers are proud to call it home. To mark the opening an athletics event was held on 10th August 2008. The Perth Common Good Fund Committee agreed to give a grant of £1000 to Perth Strathtay Harriers towards the cost of running the meeting – estimated to be about £7500, with a similar sum coming from the Corporate Financial Assistance budget. Many compliments and appreciations were published after his death and a few are reprinted here. 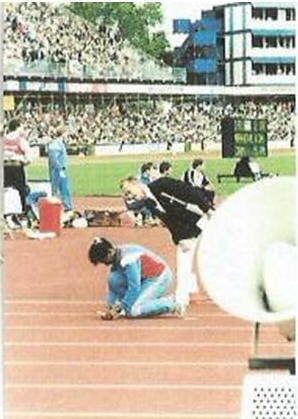 First, we have statistician Arnold Black’s tribute printed in the Scottish Athletics Yearbook in 2000. “As this book goes to press, I have learned of the death of George Duncan. For the second time in preparing this book for publication, I am filled with emotion as I type a page. 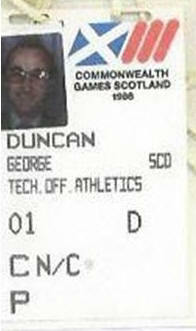 Everyone in Scottish athletics knew George Duncan. In my relatively short involvement in the sport, I have never come across anyone who worked so tirelessly for the good of Scottish Athletics, without looking for anything other than to benefit the people involved in athletics, whether they be athletes, officials or sponsors. He has been a great supporter of the Scottish Association of Track Statisticians, by speaking up for s when he felt it necessary, by providing us with information, by selling books for us, often paying us in advance before the books were sold. e had no hesitation in inviting George to be the first Honorary Member of the S.A.T.S. I hope he would have enjoyed this book, which contains a foreword by one of the young athletes he helped progress in the sport, Richard McDonald. There are people in athletics who work to some hidden agenda. George was not one of them. He was always fair, honest and supportive of good causes. He was tremendously helpful to me personally and i consider it a pleasure and a privilege to have known him. “In 1988, Inverness Harriers finished second in the SYAL behind Clydebank. This was the first year that the Scottish champions were invited to compete in the English Auxiliary Final but Clydebank had to turn the invitation down because, due to the ineligibility of a large number of their English second claim athletes, they didn’t have a viable team. The invitation then passed to Inverness who duly went to Birmingham armed, among other things, with 130 sprigs of white heater to distribute as gestures of goodwill. Immediately after that final George, in his SYAL capacity, had a letter in the Inverness Courier praising the manner in which Inverness had represented Scotlandat te event. That certainly did the club a whole lot of good on the local scene at a time when upgrading the Queens Park was an ongoing campaign.